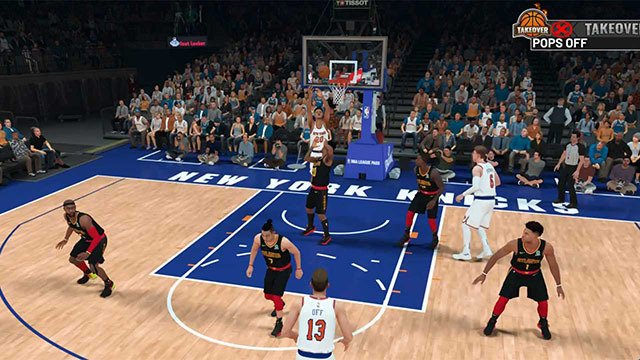 Aim at the opponent’s hoop and shoot, get close to the metal ring and dunk, you mastered the attacking skills of NBA 2K19. NBA 2K19 is more simulation oriented than ever before, so dunking isn’t as easy as just pressing a button. Although shoot or pass to allies are decent choices, but I will make a dunk if the ball holder has decent dunk stats. However, dunking in NBA 2K19 can be pretty common place once you know what you need to do. In NBA Live 19 gamers can’t check the specific attributes like dunk or juke of a specific player, but 2K Sports provides the possibility. Your best chance to get a dunk in NBA 2K19 is to have a player with a high stats for the move. Leap and fire the ball toward wrong direction, make your opponent jaw-dropping. Dunk is a tactic method to win basketball match, while to Buy NBA 2K19 VC & MT from pointssale.com is a wise way to win even more. Although the court isn’t big, when five defenders surround you, the pressure of protecting the ball make you easily lose the sense of direction. You can know where you should sprint, and the distance between you and the basket. You can check the specific button control from NBA 2K official forum pinned threads, now we won’t overstate here due to the limited time and space, we want to introduce more cautions for you to make a better dunk. Throw your ball to your allies to help them making a dunk is also an important part of a NBA 2K19 match. Within the NBA 2K19 game, you can perform a variety of other entertaining dunks. They include the Reverse, Spin Dunk, Eurostep, Hopstep, and Free-Throw Line dunks. Reverse Dunk: Do not let the opponents read your purpose easily. Press R2 (PS4) or RT (Xbox One) to sprint towards the basket on the baseline. Hold R towards the baseline. Spin Dunk: Initiate it when you have a chance, you can easily juke the tacklers around. Press R2 (PS4) or RT (Xbo) to sprint towards the basket. Double tap Square Playstation 4 or X button XB1 and hold R2 as you do it to perform the dunk. When you are doubting your gaming skills, you’d rather practice more in NBA 2K19 or in real life with your friends. So only make dunks when it’s proper. You should ensure your shoot and alley-oop both great enough then you can make high difficulty dunk. Different from reality, every player in different height are same to dunk in NBA 2K19, so you don’t need to worry about the players’ height or wingspan neither. You will always meet pro players in higher leagues, so to improve yourself is the key point. Opponents won’t let you make a free throw line dunk in most of situations, if you did, you should have win him/her a lot of points. Do not smurf your rival, they will be upset to the game and may be report you. Be kind to every foe you met in your life, and beat them in a moral way. That’s all there is to it, though! That’s how you dunk in NBA 2K19. A lot of things come into play when trying to dunk in NBA 2K19. You have player stamina to deal with, as well as whether a player has the given attributes to do a dunk and whether the player has a path to the basket as well. We wish you will have a correct understanding on this special scoring method, instead of abuse dunk in 2K19 even if when you are facing tons of tacklers intermediate you from making a dunk. Copyright © 2011 gamegoldfirm Inc. All rights reserved.